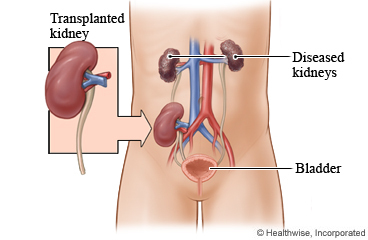 How is a kidney transplant done? What should you think about before getting a kidney transplant? A kidney transplant gives you a healthy kidney from another person. You may need a transplant if your kidneys work poorly because of diabetes, high blood pressure, or another illness. You need only one kidney to live. The new kidney can do the work that your own kidneys cannot. It will remove waste from your blood and keep your body's fluids and chemicals in balance. A new kidney can improve the quality of your life. You are likely to feel better and have more energy. The new kidney may come from someone you know, a stranger, or a person who has died. Getting a new kidney can sometimes take a long time. You have to meet certain rules to be able to get a kidney. For example, your overall health (other than kidney problems) has to be good. If a relative or another living person gives you a kidney, you may not have to wait long. If you need a kidney from a person who has died, your name will be put on a waiting list. During surgery, your doctor will put the new kidney in your body and leave your own kidneys where they are, unless there is a reason to take them out. Your doctor will connect the blood vessels of the new kidney to your blood vessels, and the ureter of the new kidney to your bladder. (A ureter is the tube that carries urine from the kidney to the bladder.) The new kidney may make urine right away, or it may take a while to work. If the new kidney does not work right away, you will have dialysis until it starts to work. The transplant usually takes from 3 to 6 hours. You may stay in the hospital 5 to 10 days. After you leave the hospital, you will have follow-up visits to make sure the kidney is working well. The living person who gives a kidney to you will likely stay in the hospital for about a week. Learn as much as you can about kidney transplant centres. You will need to have blood and tissue tests done that will be used to match you with a donor. It can take months or sometimes years before you receive a new organ if your name is on a waiting list. When a kidney becomes available, your transplant doctor will consider whether the donor is a good match for you. The team also will look at your current health and how long your name has been on the waiting list. After the transplant, you have to take medicine every day for the rest of your life. The medicine will help keep your body from rejecting the new organ. Sometimes these medicines cannot stop your body from rejecting the organ. If this happens, you will have dialysis again and may wait for another transplant. Medicines to keep your body from rejecting the new kidney can cause side effects. They can make your body less able to fight infections and may increase your risk of heart problems, diabetes, cancer, and thin bones (osteoporosis). Having an organ transplant can bring up many emotions. You may feel grateful and happy. But you also may feel guilty or depressed. Share your feelings with your doctor and family. If you are depressed, you can get treatment. You have to take care of yourself after the transplant. You need to keep follow-up visits with your doctor, take your medicines as directed, and eat well and get regular exercise. You want more information about having a kidney transplant. Enter F250 in the search box to learn more about "Kidney Transplant: Care Instructions".